AOC has been in the monitor business for quite some time, and they’ve grown and adapted as a company since their founding in 1967. 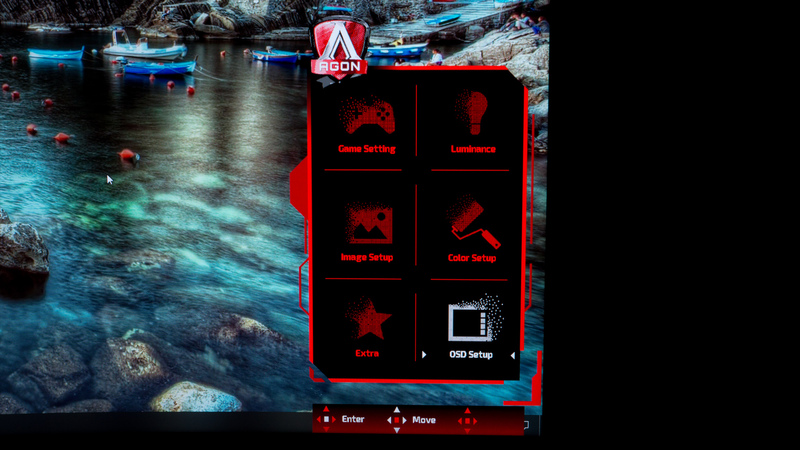 AOC still produce office and consumer displays as well as making monitors tailored towards content creation. 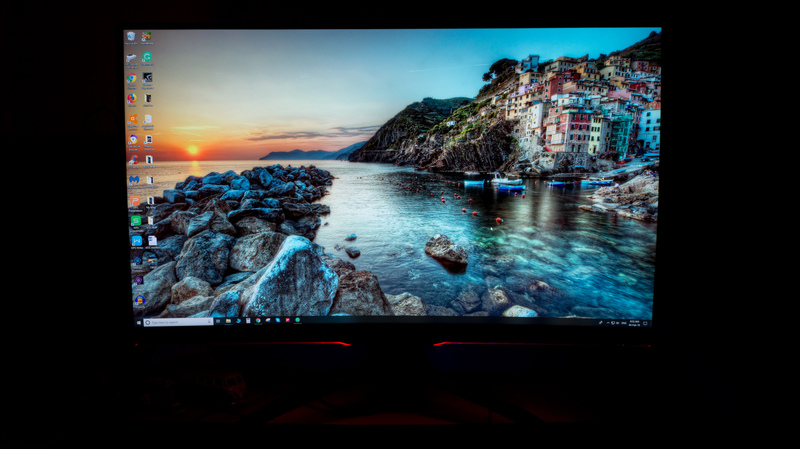 They also still make gaming monitors such as the G2460VQ6 that sport the AOC name, but they wanted a brand with a new identity that has a different goal to the main core business. 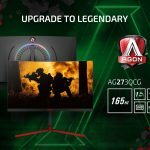 This new avenue led to their gaming monitor division AGON which focuses on delivering high-quality well-priced gaming monitors that suit various different needs and budgets. 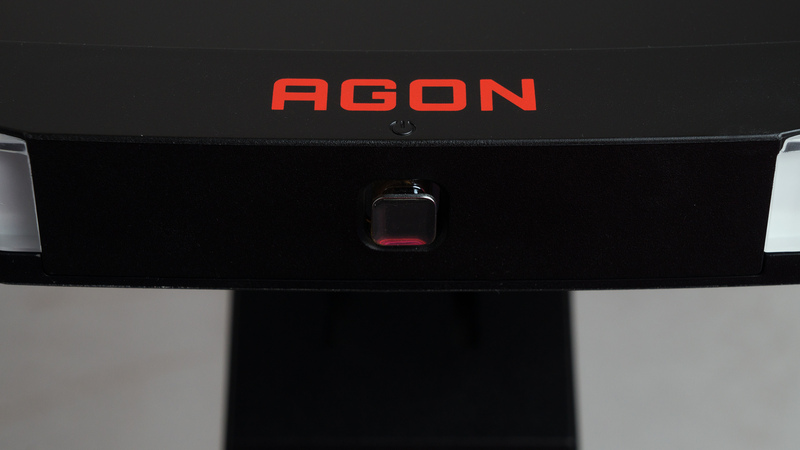 Today we’ll be taking a look at one of AGON’s latest gaming monitors which is the AG322QC4. 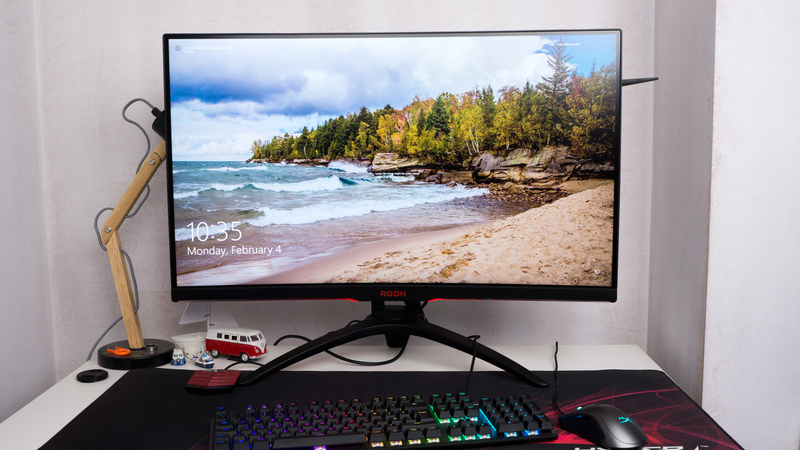 This monitor has a long list of features with highlights that include, Freesync 2, a 144Hz panel, HDR400 support and a whole host of features that gamers might be looking for. 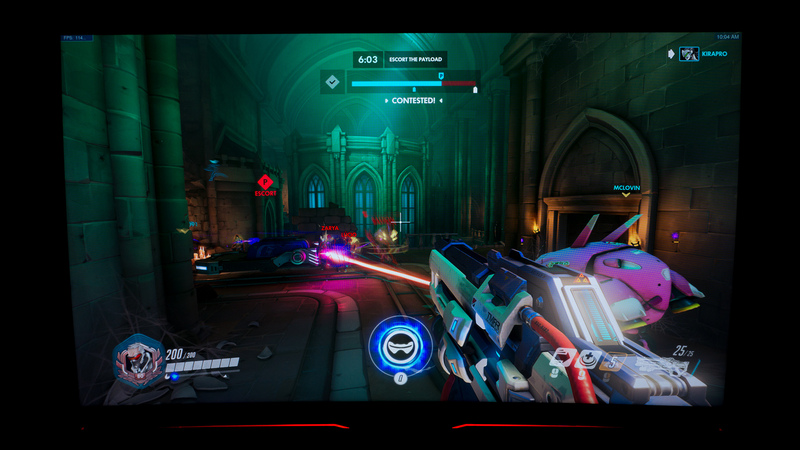 So, let’s take a closer look and see how this £400 monitor performs. 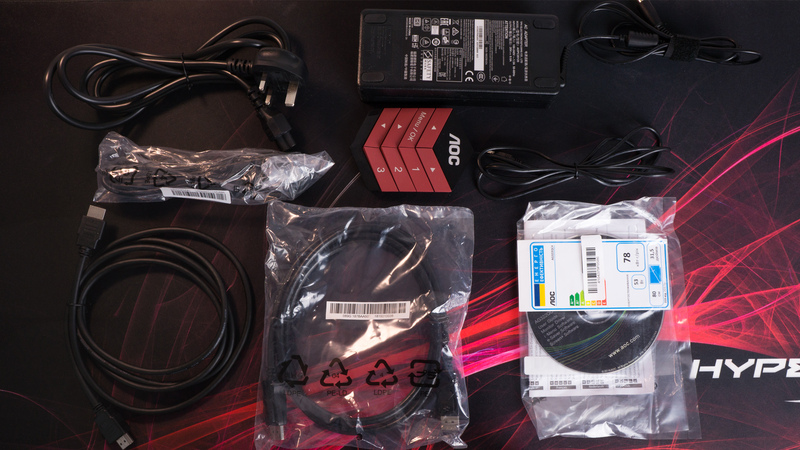 Within the enormous, well-packed box, there is the panel, the stand, some mounting screws, a display port cable, HDMI cable, USB cable, the power adapter, the documentation and driver disk. Right off the bat, you can clearly tell that the AG322QC4 doesn’t shy away from its target demographic and goes pretty hard with the gamer aesthetics. This is clear thanks to the red AGON branding which is flanked by two sharp-edged LED accent strips. The stand is also pretty beefy looking too, and it needs to be to support the pretty massive curved 31.5″ VA panel. In terms of first impressions, the AG322QC4 has a real impact visually and a definite solid presence when placed on your desk. 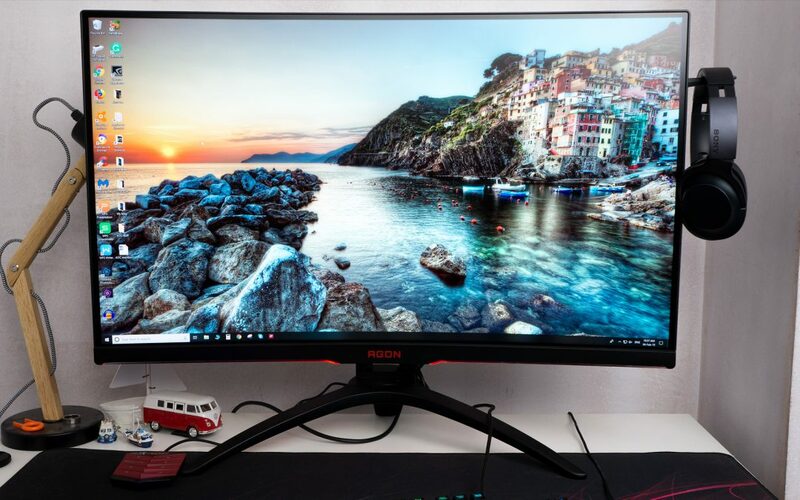 Taking a closer look at the monitor, the front is very nice and features really small physical bezels around all the edges apart from the bottom. 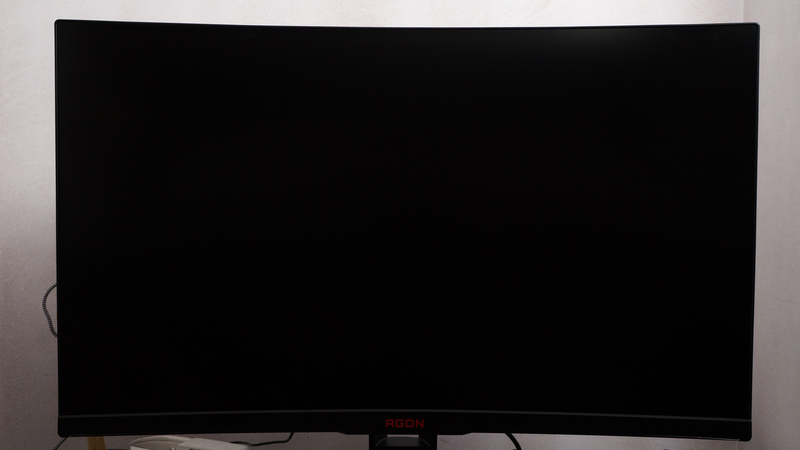 The lower bezel is pretty thick in comparison to the rest, and on here you’ll find the AGON brand name as well as those previously mentioned LED accent strips. Zooming in on the AGON branding you’ll note that it is painted on and you may also be able to see the very subtle power button indicator. This is quite difficult to see in the dark as it’s very stealth, but if it were white or red, it would look odd. I think AOC have made the right call here and kept the front looking really clean. 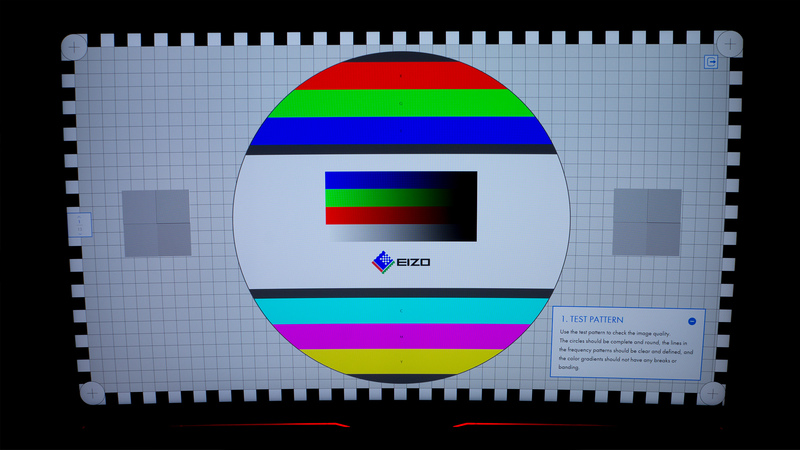 Looking at those bordering bezels you can see that they are very slim (approximately 0.3mm), however, when the monitor is on, there is a thicker black border around the left, right and top of the display and a slimmer one at the bottom. This doesn’t really impact the viewing experience as a whole, though it does somewhat take away from the aesthetics when the display is on. 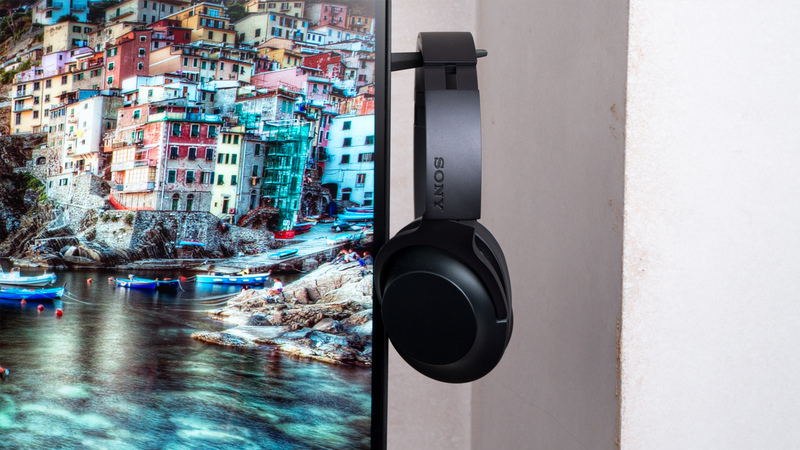 On the right-hand side of the display, there is a handy pre-installed headphone hanger, this is great as you can keep any headphones off your desk and out of the way. Plus it folds away when you don’t want or need to use it. 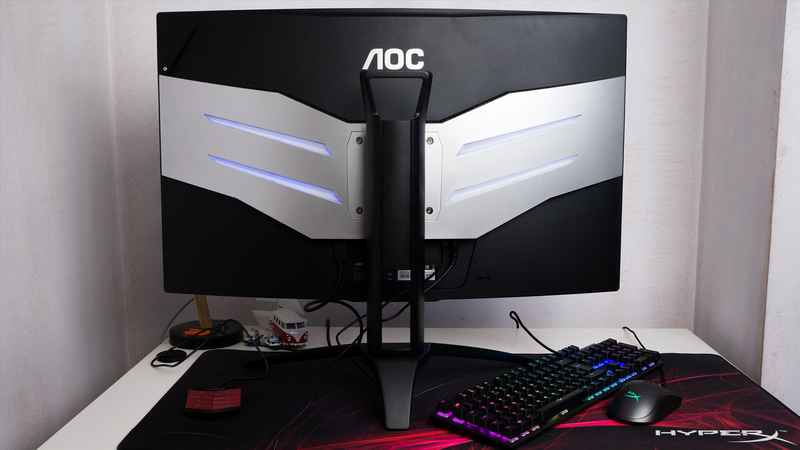 Round the back of the AG322QC4, you’ll find an AOC badge, a faux metal mid-section that houses some LED accent strips and the 100×100 VESA mount and finally the bottom section which is plain black. You can also see the stand which provides 110mm of height adjust as well as 30~30 ° swivel adjust and -5.5 to 29 ° tilt adjust. 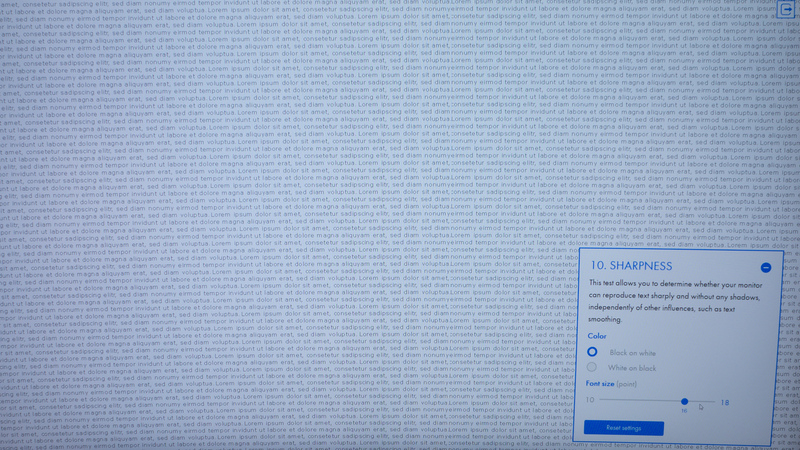 This isn’t the most customisation we’ve ever encountered, but for a monitor this large, it’s quite impressive. 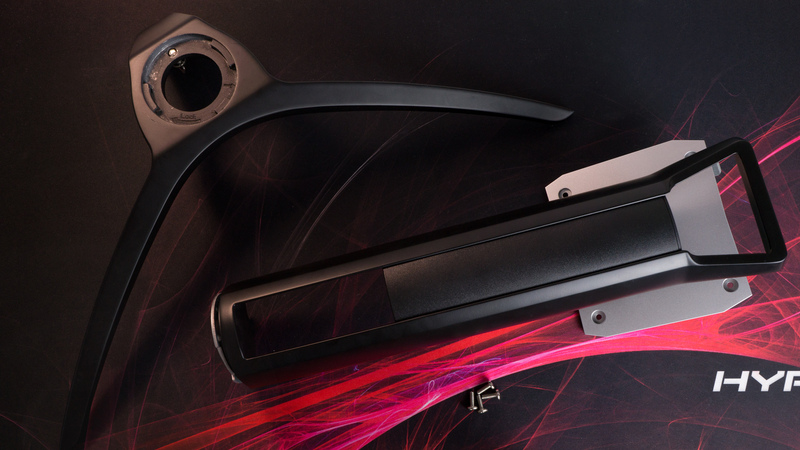 The AG322QC4 features a curved panel, it’s not the most curved on the market, but it does have a gentle curvature that helps with immersion. We’ve checked the specs and can’t find what radius the curve is, but we’ll update the review as soon as we do know. The underside of the mid-section is where you’ll find all the ports, and there are quite a lot of them. For display, there is a VGA, 2 x HDM 2.0 and 2 x DisplayPort 1.2. You’ll also find two USB 3.0 ports and a headphone (3.5mm) output. Finally, the underside of the front bezel is where you’ll find the main power on/off switch which also doubles as a toggle to control the OSD. 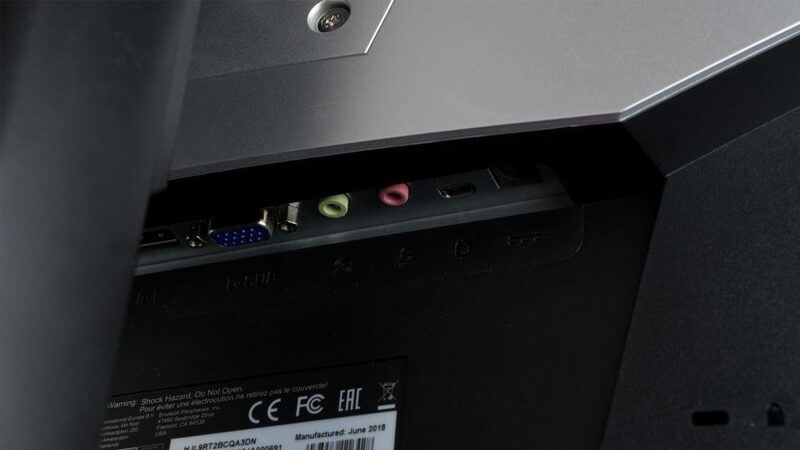 Aside from the monitor, you also get a handy control module included in the box, this plugs into the back of the monitor and allows you to access the OSD without having to touch the main control on the monitor. On the control module, you’ll find, forwards and backwards keys, a menu/select button, and up/down button and finally, a further three which can change the profile of your monitor. In terms of design and build the module does match the aesthetic very nice with its red/black colour scheme and style though it does feel a touch plasticky, we can’t complain, however, as it’s a very nice addition that works wonders and really does make navigating the OSD that much easier. Now we get to the most vital part of any monitor, and that is the display. The AG322QC4 features a slightly curved 31.5″ VA panel that is WLED backlit; the resolution is 2560×1440, and it has a refresh rate of 144Hz. The monitor’s aspect ratio is 16:9, and it has a static contrast of 3000:1 with a dynamic of 80M:1. 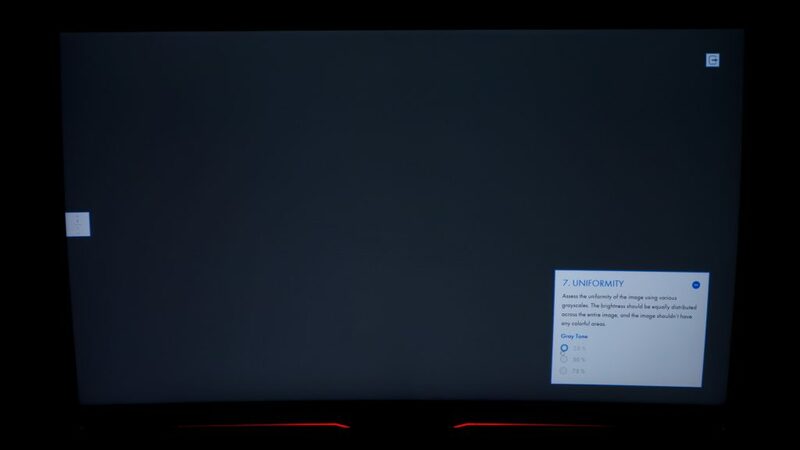 The monitor is capable of displaying 16.7 Million colours and also has HDR400 support as well as being FreeSync 2 enabled. For our testing, we used the sRGB profile, unless stated otherwise. In terms of colour accuracy, the VA WLED backlit panel is really good; unfortunately, we couldn’t determine the actual sRGB and RGB values as I don’t have any of that equipment to hand, but the panel (to my eyes), looks good. Colours are nicely vibrant and not too over the top, the saturation and contrast seem to be well checked though they do appear to pop that little bit more than they do on my regular IPS monitor. Oranges and reds appear to be the most saturated by default, whereas blues and cyans are a touch more muted. 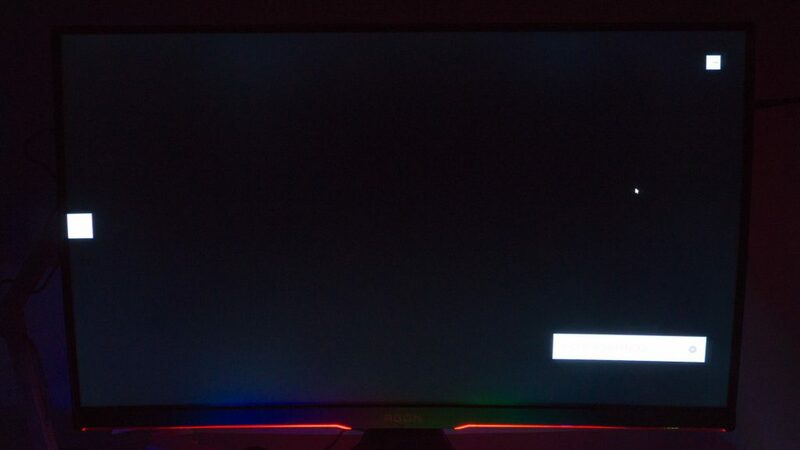 Coming from an IPS monitor, I did note that for colour sensitive work the VA panel isn’t quite as good, so if you’re using the monitor for more than gaming, keep this in mind. For casually uploading media to a blog or social media, editing photos and video is pretty good and does yield decent results, but if you’re doing it for an online publication or in a professional capacity, you’re best off using an IPS panel. Now I can’t fault the AG322QC4 for this as it was never designed for photo or video work, but what I’m trying to say is that it can be used for those types of task, if only in a casual capacity. We also did notice some slight colour shifting when viewed off the central axis which is a result of the curve and panel type. As for the sharpness, the AG322QC4 performed very well and is great for everyday tasks such as browsing the web, reading articles and writing. With a resolution of 2560×1440 spread over the 31.5″, the relative pixel density is only 93.24, but honestly, during my time with the monitor, I had no trouble reading anything that was displayed on screen. So far the panel has impressed, but the uniformity is where this panel starts to falter (with our sample at least). When displaying lighter colours, there are some areas where the backlight is ever so brighter than in others. This isn’t too noticeable day to day, but on occasion, we did spot this. 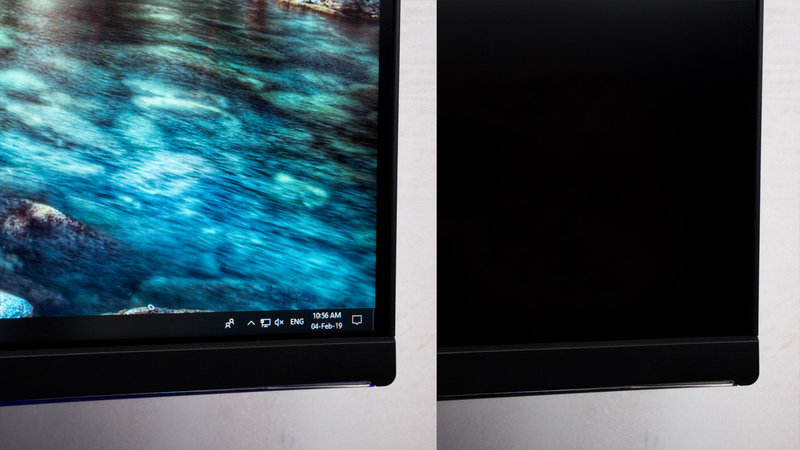 When displaying darker colours we did note that there was some light bleed at the top and bottom edge of the monitor, again this isn’t noticeable on a daily basis, but if you’re displaying a lot of dark colours, you can sometimes catch a glimpse of it. 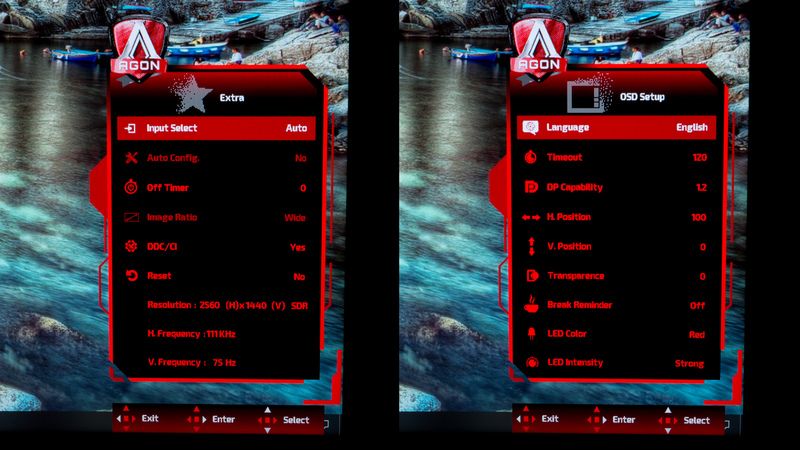 As for the HDR, the AGON AG322QC4 can’t display HDR over Display port as the ports are version 1.2 instead of the newer version 1.4 which does support the HDR standard. Fortunately, the monitor does have HDMI 2.0 which does support HDR. We wish that this was made more clear off the bat as it would resolve any potential headaches when it comes to choosing the correct port and cable to get this feature to work. Also when using HDMI 2.0, the max supported refresh rate gets knocked down to 75Hz instead of the 144Hz the monitor is capable of. This is unfortunate as you can’t have both 144Hz and HDR on a single cable. Luckily as the monitor has plenty of ports, you can easily switch between Displayport and HDMI to best suit your needs, though this is more work than it needs to be. If the monitor had Displayport 1.4 as standard, this wouldn’t be an issue. 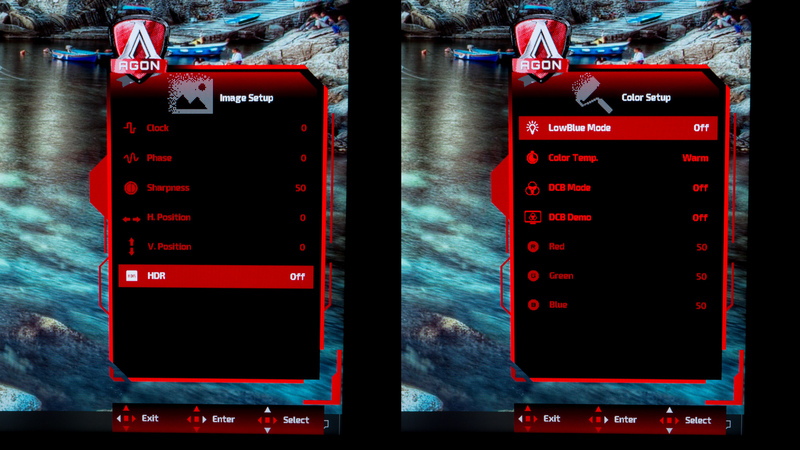 We also noted that you can’t change game modes or eco modes in HDR, so you are stuck with the default HDR profile configuration. Now we’ve addressed that, let’s look at the HDR performance of the AG322QC4. By default, HDR in Windows 10 looks washed out with a real lack of saturation, colour, contrast and brightness when enabled, however, enabling HDR in the OSD completely transforms the image and makes it look much better. So be sure to enable this setting before trying out HDR for yourself. When enabled in the OSD all the previously mentioned issues disappear, and the colours become instantly more vibrant, though whites and lighter colours still do have a slight contrast issue. Looking at the SDR and HDR images side-by-side and there isn’t much difference, though there are some subtle things that aren’t the same. For example, the HDR image has darker shadows, slightly more saturated colours and highlights that are a touch more bright. In person, the difference is bigger and you can spot those changes more easily, though personally I still prefer the image of the display in SDR mode with the sRGB profile enabled. 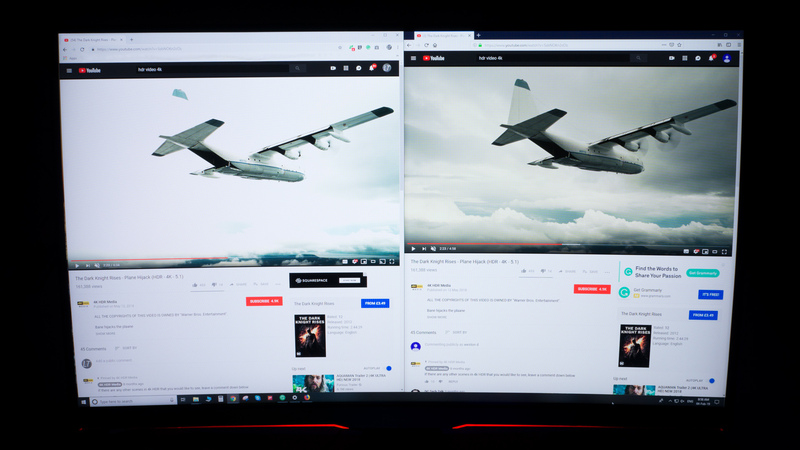 Chrome support for HDR is not very good, watching the same video side by side vs Firefox and you can see there is a huge difference (Chrome on the left – Firefox on the right). The sky in Chrome looks completely blown out, the shadows are too bright, and the overall image is pretty poor. Then Firefox is the complete opposite, the colours look great, the sky has good dynamic range, the highlights aren’t blown out, and the shadows look better. 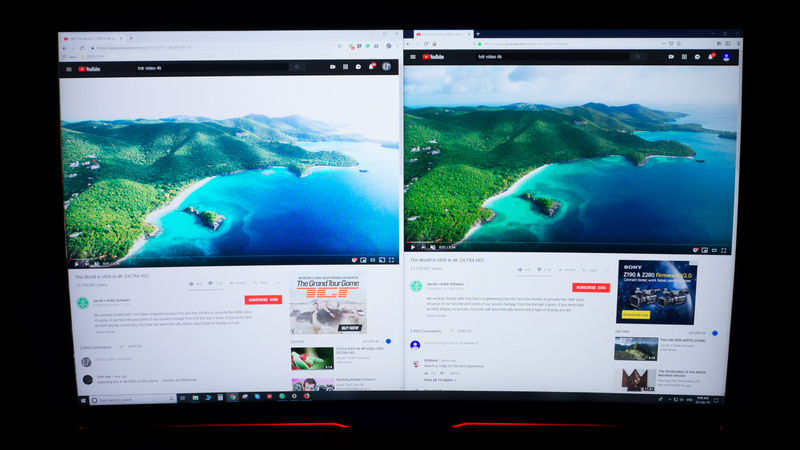 So if you plan on watching HDR on YouTube or via Netflix, we’d advise using Firefox instead of Chrome as Firefox seems better equipped at handling HDR and HDR content. 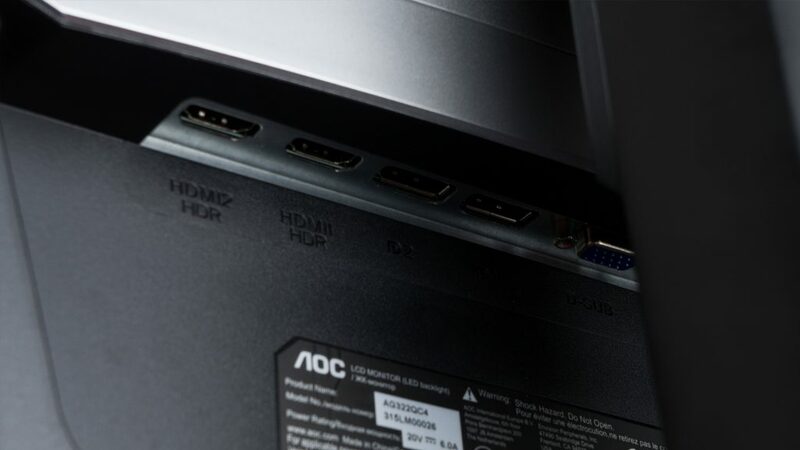 The AGON AG322QC4 uses the latest standard of Freesync which is version 2, unfortunately, we couldn’t test this as my test system uses a GTX 1070 which is an Nvidia GPU, so Freesync would not function. However, even paired with a GTX 1070, the AG322QC4 performed incredibly for gaming and is one of the better experiences I’ve ever had. For this portion of the review (test wise) I fired up Rise of the Tomb Raider at 1440p (haven’t got round to the new yet), and Forza Horizon 4 and I have to say I was very impressed. Using the sRGB colour profile, the dynamic range was very strong and the colours had good levels of saturation and contrast. The image produced was nice and sharp with plenty of detail which further enhanced the whole experience. 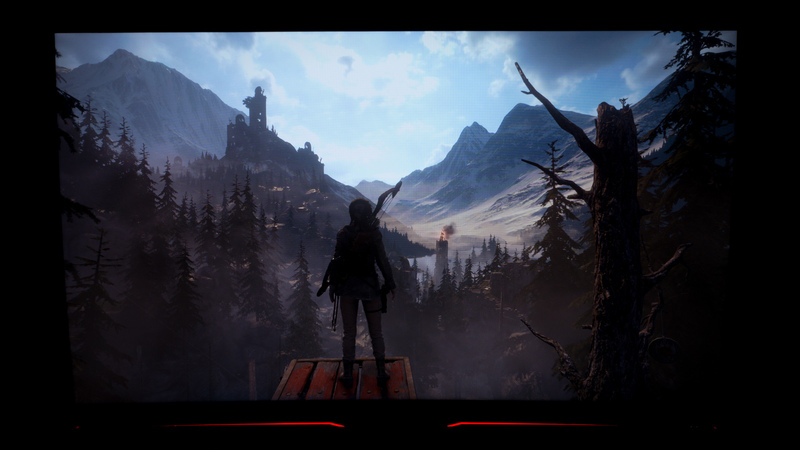 When playing ROTTR in the Geothermal Valley, I had to stop in awe as I was highly impressed by what I was seeing. I’ve played this game countless times, but never have I stopped so much just to admire the scenery (apart from when I played in 4K). The motion was very smooth and fluid, and there were no signs of ghosting at all. Overall, for these types of titles, the AG322QC4 really impressed. Gaming at 1080p is how I tested the monitor for its 144Hz capabilities, I would have liked to have pushed the resolution to 1440p, but my GTX 1070 and Ryzen 7 1700 couldn’t manage that. But nevertheless, the experience was great and highly enjoyable. The gameplay was silky smooth and honestly so much more fluid than at 60Hz or even 75Hz. It’s true what they say, there is a big difference, and although I didn’t magically become a better gamer, I found that I could track and hit moving targets that much easier than at 60Hz. 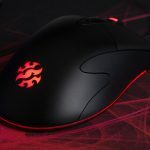 This was great when I played Overwatch and CSGO as I didn’t feel as restricted, and neither did my hardware, this meant that I could game with more than I had previously, as the monitor wasn’t holding either back. The monitors GTG may not be 1ms (in fact it’s 4ms), though that didn’t really dampen my gaming experience at all. The input delay is minimal, and all my actions were translated to the screen with no visible delay, though if you want a reduced delay for truly competitive play, you’ll likely want to look elsewhere to keep any slight edge the lower response time will provide. We will say though, is if you plan eSports titles or competitive games on a casual basis or a non-pro level basis, then the AG322QC4 is highly capable and offers a superb gaming experience at higher refresh rates. 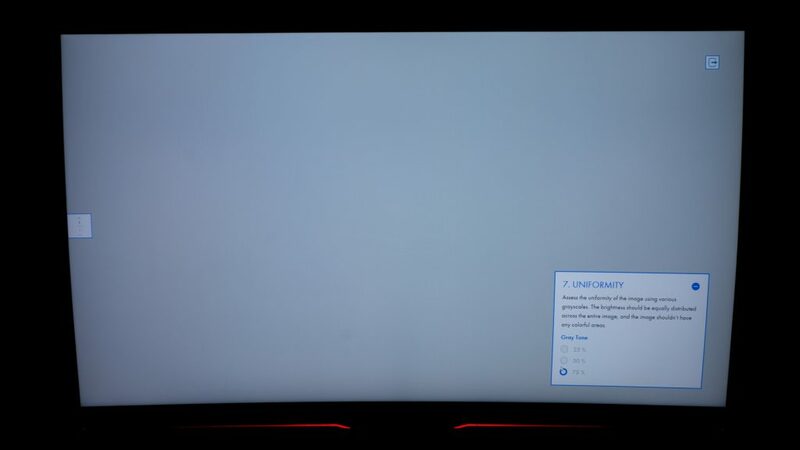 HDR gaming on the AG322QC4 left me with mixed feelings. 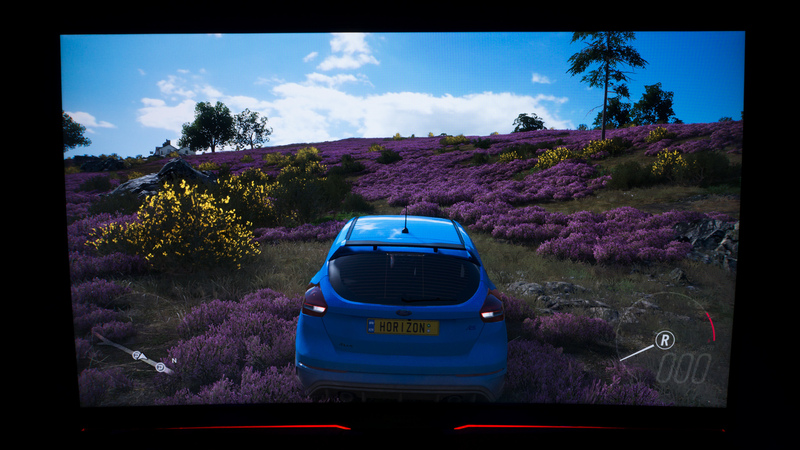 I’ve played Forza Horizon 4 before, but when playing it on the AG322QC4, I noted something strange. When the HDR was switched off the game looked really flat and very dull as all the colours seemed muted. Now my previous experience with FH4 was not like this and was, in fact, a lot nicer. The culprit here was the in-game settings. When HDR was disabled in Windows, the game still applied all the HDR settings to the SDR image causing the image to look washed out and very dull. So keep this in mind and be sure to restart your game before switching between HDR and SDR so you don’t experience this. I’m sure in time this issue will get fixed, but for now, this is one of the drawbacks to HDR. However, in a real-world situation, you’re not likely to keep switching between HDR and SDR, so you may never have to deal with this. When utilising the method above and really seeing the difference between HDR and SDR, I was not overly impressed. Looking at the SDR and HDR image side by side and there is very little difference between the two (with the settings I opted for). But if you spend some time tweaking the HDR image it will become a little more vibrant with heavier levels saturation as well as having darker shadows. Personally, I wasn’t a huge fan of this look FH4, but for other titles, it might look better. So be sure to spend some time tailoring the image as HDR can look very nice, if you are willing to tweak it. One final note on the HDR front is that this monitor only supports the HDR 400 standard and not the full-fat HDR 1000, this is likely why we didn’t experience a drastic difference between SDR and HDR. 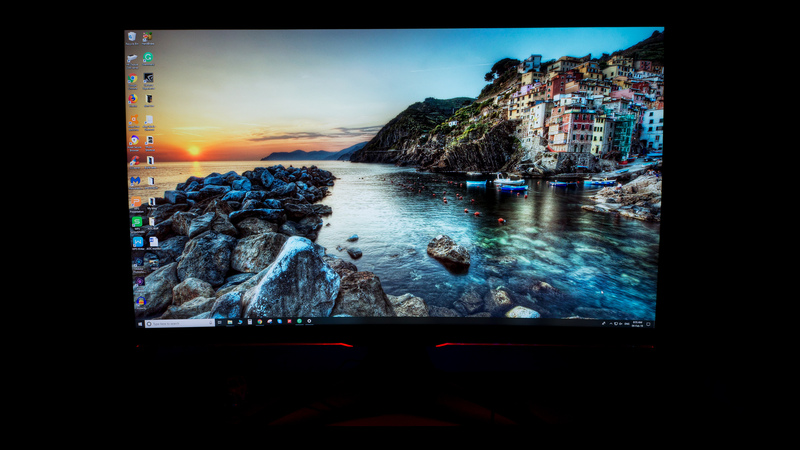 Although we did see some minor differences, HDR gaming shouldn’t be at the forefront of your decision when looking at this monitor. 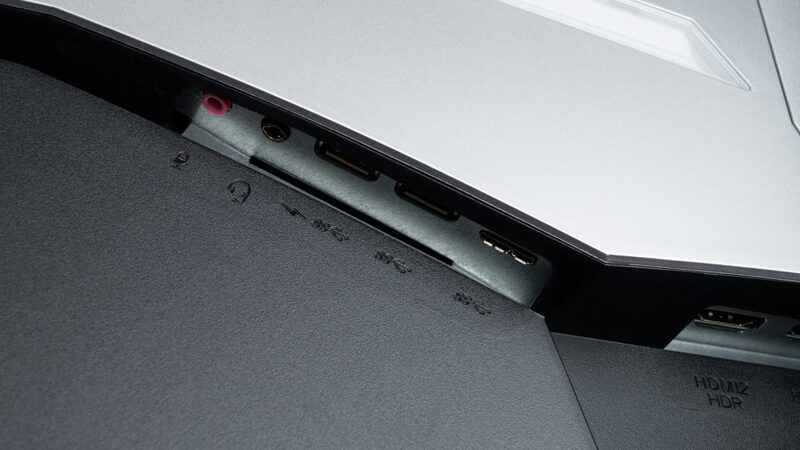 For audio, the AG322QC4 has two upward firing speakers that are mounted around the back of the monitor as well as an audio port to plug in your headphones. The speakers are a nice addition if you don’t have any, but they aren’t a massive strong suit of the monitor; they get loud enough, but the quality isn’t all that good. Listening to music, gaming and watching movies is an okay experience as the speakers are reasonably clear though they are quite tinny and a touch thin sounding with no real depth. So we would recommend using a set of dedicated speakers to get more from the monitor and to enhance any form media you may be consuming. Alternatively, you could plug some headphones, though again the quality isn’t amazing. We found that when compared to plugging directly into the motherboard, the audio wasn’t as rich nor as detailed. We really appreciate the port, especially if your favourite headphones don’t quite reach your PC, but we wouldn’t use it as the main source for our gaming or music. So both audio features are very nice to have, but we’d still recommend using either a set of PC speakers or plugging your headphones directly into your PC for the best result. The OSD on the AG322QC4 is concise and very easy to use whether implementing the control module or the screen toggle. To access the OSD you press the menu/ok button on the module or press the toggle (power button) on the monitor. 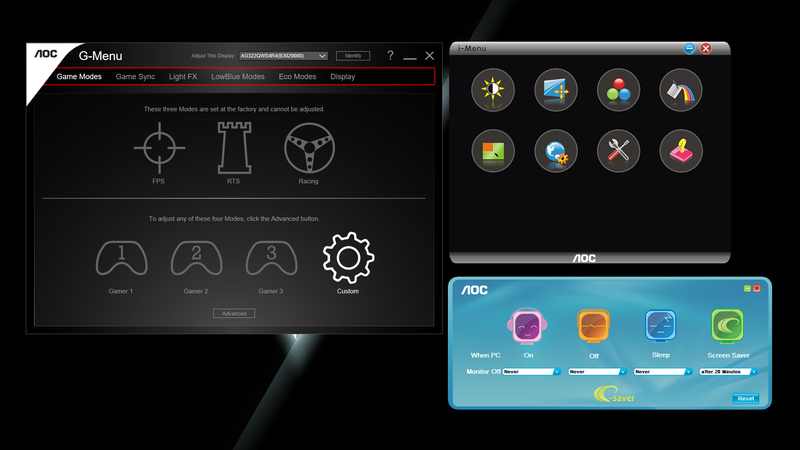 Once in the OSD there are six main options to choose from, the first is Game Setting and within there you can switch the game mode on or off, alter the shadow control, change the game colour, adjust the dial point and overdrive as well as change the input lag, add a frame counter and change the volume. The next option is Luminance, and here you can change the contrast, brightness, alter the Eco mode, change the gamma and turn DCR (Dynamic Contrast) on or off. Next in the OSD is Image Setup and within this option, you can tailor the clock, phase, sharpness, the horizontal and vertical position as well as toggle the HDR on or off. Unfortunately, for some reason, we couldn’t adjust anything here apart from the HDR, so maybe one setting we have active is preventing these from being accessed. After the Image Setup there is the Colour Setup and here you can change the LowBlue mode, colour temp, activate the DCB demo and manually adjust the R, G and B levels. The final two options are Extra and OSD Setup. Extra allows you to change your input select (DP/HDMI etc), set an auto config, set an off timer, change the ratio of the display, toggle DDC/CI (Display Data Channel) on or off and reset all your settings. 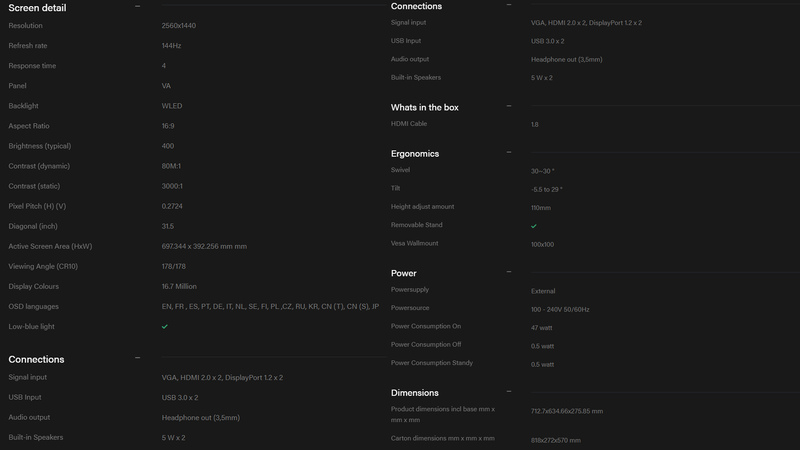 You can finally see all the different attributes of the monitor. 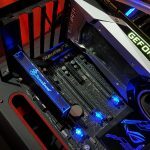 OSD Setup essentially allows you to customise the OSD. In the menu, you can change the displayed language, set the OSD’s timeout, change the DisplayPort capability, change the position of the OSD, change the transparency, set a break reminder and alter the illumination. Overall the OSD is very easy to use and has plenty of different ways to customise the monitor’s display. Some of the settings don’t do much and others over-do things. For example, the DCR mode only boosts the contrast ever so slightly, and on the other end of things, the Game Settings really alter the way the display looks, but not in a manner that is overly pleasing by default. Of course, steps could be taken to tweak the Game Settings even more and make them more appealing though that is more work than it ought to be. Keep in mind these are personal preferences, and your opinion will differ. In terms of software, you don’t actually need to install or use any as you can see from above, but if you don’t like the idea a control pad or using the toggle button, then having software would be a huge help. Within the box, there is a disk that contains a few different pieces of software that can control various different aspects of the monitor. We would advise you actually download these instead, as the ones on the disk are for an older version. Essentially, these bits of software do what the OSD does, but without having to physically use the monitor. First up is i-Menu and this does look quite dated. 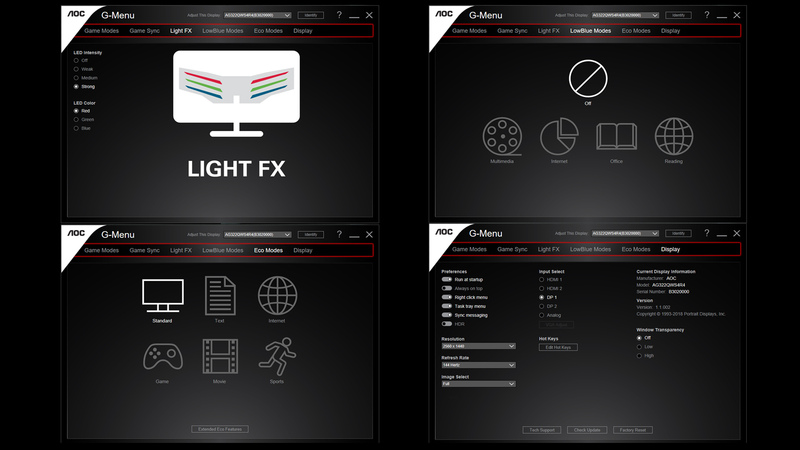 With the i-Menu, you can control attributes such as the monitor’s luminance which covers everything from brightness to contrast and even the gamma levels. Next, you can control the colour temperature, in which you can adjust the main colour profile and manually change the RGB levels. After that is colour boost and with that AOC have included six different styles of enhancement to choose from. However, upon trying to use them, we noted virtually no difference to the actual output of the display in terms of colour or saturation. After that is picture boost which allows you to tailor the vertical and horizontal position of the display. Finally, you have the settings, extra and information. 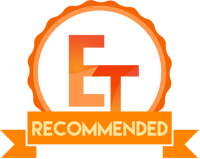 The next bit of software is e-saver which is essentially a tool for your monitor that allows you to adjust when the monitor automatically powers off and when it goes to sleep. It’s really simple, and although you can do this in windows, it’s a little more convenient than that as it’s right on your desktop. Finally, we get to the newest edition in the lineup which is G-Menu and this – as you’ve probably guessed by now, for all the gaming features. 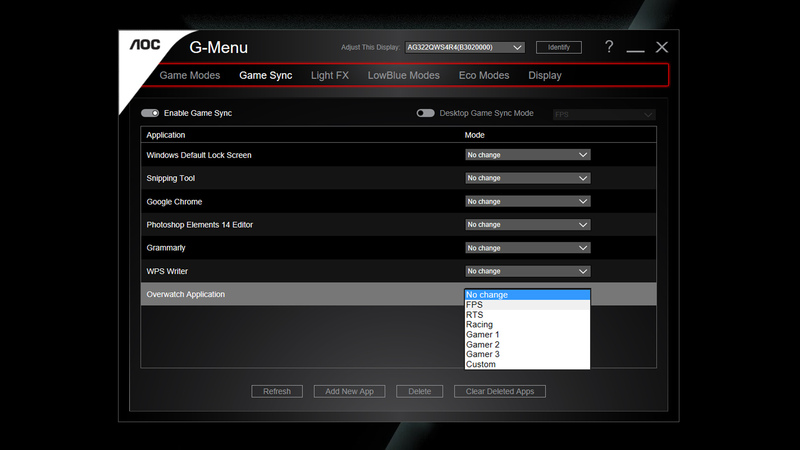 Within the G-Menu there are six different sub-menus for you to play around with. First up is the Game Modes and here AOC has implemented three different modes to suit different genres of games. After that is Game Sync and here you can further customise the game modes. Within this sub-menu, you can set different modes to different applications. For example, you could have the monitor automatically change when you load the desktop and then change again when you load your favourite FPS title. This is really impressive as you don’t have to physically change anything, other than setting it in the first place. You can also add different programs and application if yours doesn’t automatically show up in the menu. Next is Light FX which essentially allows you to turn the LED accents off or on or alternatively change the colour and output brightness of the LED accents on the monitor. After the lighting, you get the LowBlue modes which lets you filter out the blue light produced by the monitor. 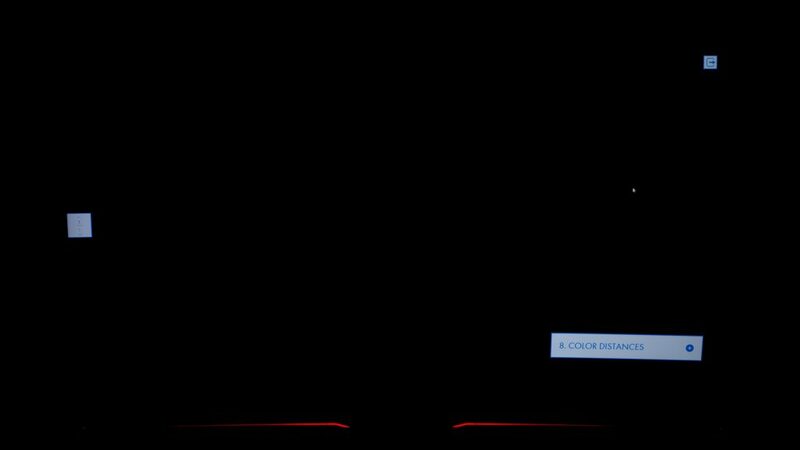 Next are the Eco Modes and there a six to choose from, these change the monitor’s display brightness depending on what task you are wanting to carry out. We used standard as the default, but if you like things really bright, then the sports setting in what you should use. Finally to the last sub-menu which is the Display. On here you can change your preferences, the resolution, refresh rate, image scale, the input type, and set window transparency which changes the transparency of the software. All in all the G-Menu software is really good and very useful, though we wish AOC would have merged all three to streamline the whole experience that much more. Performance – In terms of performance, the AGON AG322QC4 really impressed. Day to day use of the monitor was brilliant, and I honestly can’t fault it there. When just using the monitor for daily tasks the image produced was great: text was sharp and easy to read, colours where vibrant and pleasing and the extra size did come in handy for using two applications at the same time. My experience wasn’t perfect though as our sample did suffer from some panel uniformity issues as well as having some backlight bleed, though these weren’t overly present on an everyday basis. For solely doing other colour sensitive tasks such as photo and video work, we wouldn’t advise you pick this monitor up as there are better samples out there for considerably less than this, then again this was never designed for that type of workflow anyway. However, for casually editing photos for social media, it was more than capable. Gaming is where it really shone, and whatever was played on it, was handled extremely well; whether it was solo adventure titles or fast-paced shooters, the AG322QC4 handled them impeccably. The HDR performance left something to be desired, and I personally wasn’t a fan, though I can imagine some will like the extra vibrancy and punch it can bring. 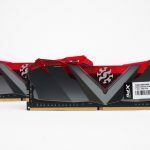 Freesync is sadly something we couldn’t test due to it not being compatible with my test system, but even without an AMD card, the monitor performed excellently. 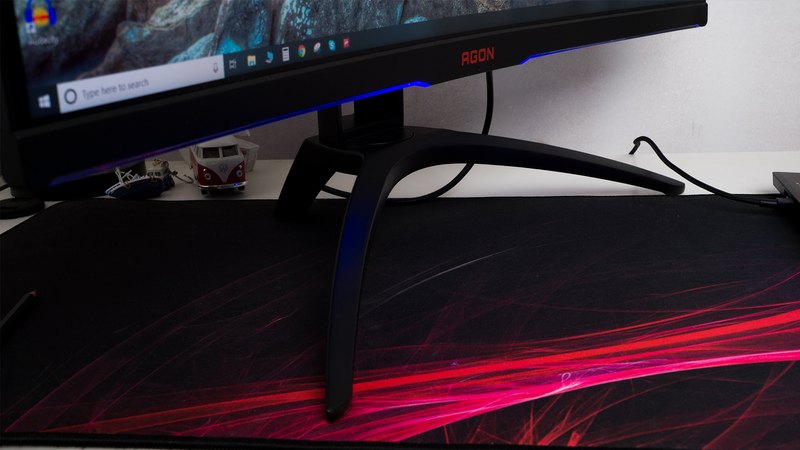 Design – Design wise the AG322QC4 is right on the money from what you’d expect from a gaming monitor; it’s slightly edgy, has illumination and has a fair few features gamers would probably appreciate. 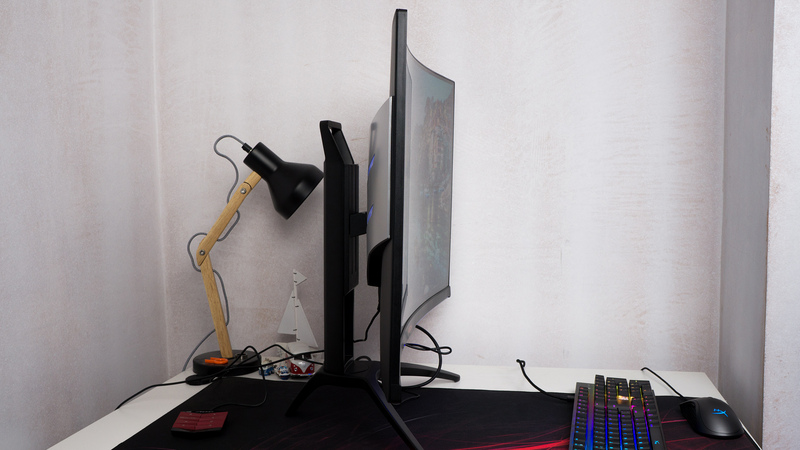 The monitor is on the big side, so be sure to check your desk to see if it can accommodate a monitor this large. Plus it has some decent flexibility too as it has a good level of height and tilt adjustment. In terms of build quality, the AG322QC4 feels very well put together. The base is sturdy and strong – which it needs to be, plus the panel feels great. The plastics used are good quality and don’t feel cheap at all. The fit and finish are great too, and we didn’t really spot any areas of concern. Value – Coming in at £400 the AGON AG322QC4 is priced about right given the large array of features the monitor has plus the excellent design and build quality of it. 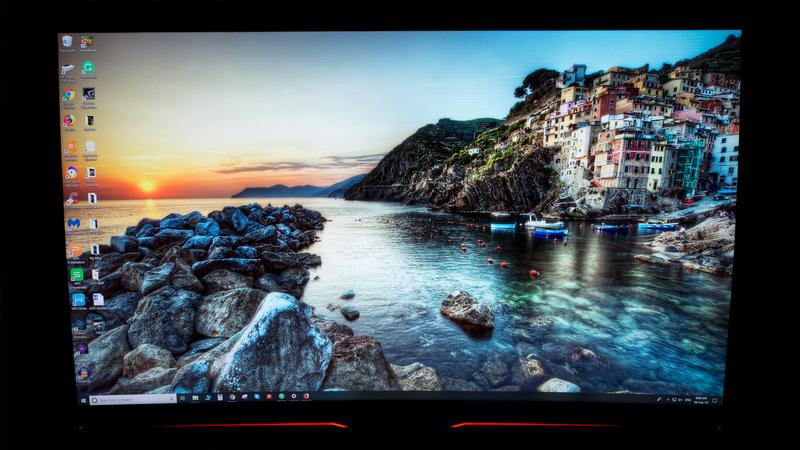 I mean it’s 31.5″, 1440p, 144Hz, HDR enabled, has plenty of ports for everything, supports Freesync 2 and has plenty of gamer focused features that a lot of users would appreciate. 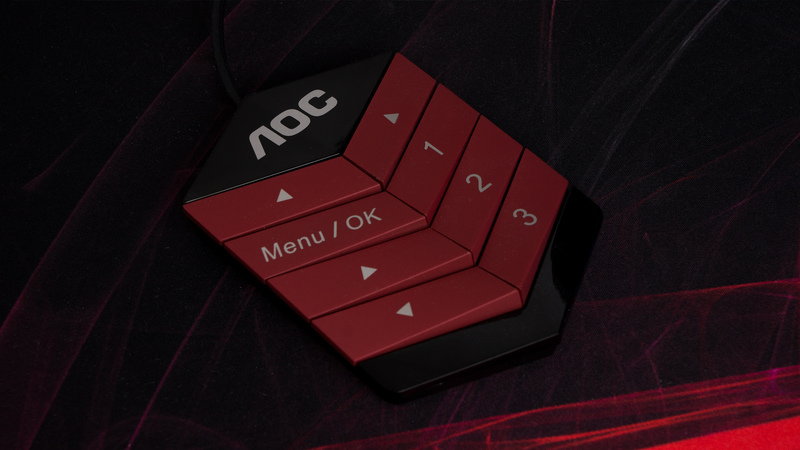 It isn’t without its quirks though – like we’ve already outlined, but as a whole for the price, we can highly recommend the AGON AG322QC4 as it gets so many things right and most importantly, is fantastic for gaming.